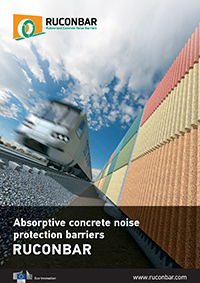 RUCONBAR is highly absorbing environmentally friendly concrete noise barrier. Its absorbing layer is produced out of recycled waste tyres along with concrete. The technology of producing lightweight concrete by incorporation of recycled rubber granulate presents innovative technology for production of high absorbing noise barriers and as such is unique on the market. RUCONBAR concept represents an economical, simple to implement, ecologically sound solution for noise protection. environmental protection by preventing disposal of recyclable materials on landfills and reducing CO2 emissions.